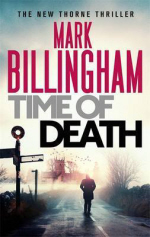 This year's Thorne thriller by Mark Billingham sees Tom Thorne and his partner Helen go on holiday; but instead of the old cliché about a detective going on holiday and stumbling across a crime, Thorne and Helen deliberately interrupt theirs to seek one out, when they hear of a serial killer of teenage girls in the Warwickshire town where she grew up. Specifically, the prime suspect is the husband of one of Helen's old school friends, so they go to lend some support - although why exactly she suddenly feels so responsible for someone she hasn't spoken to since she left town is one of the novel's mysteries. The other one is who the real killer is, because Thorne becomes convinced the police have the wrong man - as the title suggests, there's something about the Time of Death that bugs him. So we're back to a bit more of a conventional detective story although this time the police are far from welcoming Thorne's help. I like how we've now got to the stage where Billingham focuses almost as much on Helen - whom he introduced in her own story a few years ago before bringing her to the main series - as he does on Thorne, giving the story two different points of view. And this one has a clock-ticking dénouement that had me really anxious reading it.